The TWG-FCAS has also developed a comprehensive open access Collection of resources and organisations on health systems in FCAS. The Collection and Key Issue Guides have been funded by the ReBUILD Research Programme Consortium. In countries affected by conflict and crisis, particularly those with protracted crises, the functioning of the health system is significantly impaired. Often it has deteriorated to the point where public health care is no longer widely available. Those seeking to rebuild these health systems will face multiple challenges including the destruction of health infrastructure and supply systems; the lack of health workers; fragmentation and lack of co-ordination between multiple formal and informal providers; and weak governance capacity to coordinate and develop the health system anew. But there will also be opportunities to put in place elements that previously did not exist. Tackling access and coverage of health systems in fragile and conflict-affected settings, for example, means addressing the needs of long-neglected vulnerable groups, such as women-headed households, the elderly, orphaned or abandoned children and the disabled. It also requires a financing policy that aims to meet universal health coverage goals. Prioritising and sequencing are thus critical elements in rebuilding the health system, particularly as decisions made in the transition period can often determine the long-term direction of development for the health system. The World Health Organization’s health systems framework highlights several critical factors when it comes to rebuilding health systems in these contexts. 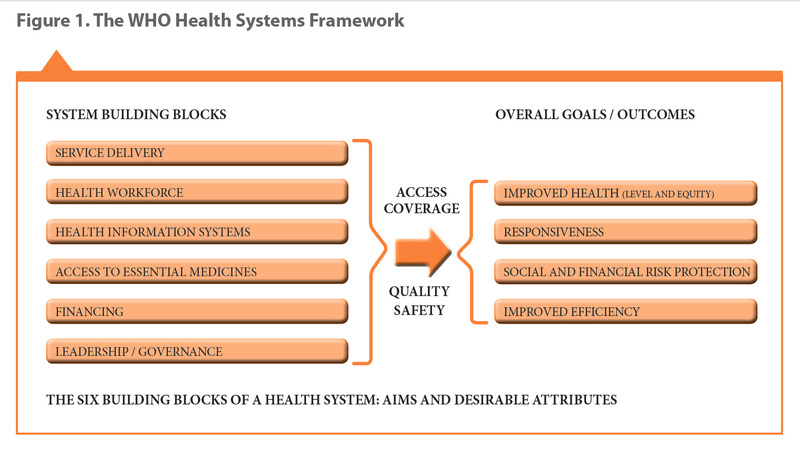 The WHO framework focuses on six building blocks - service delivery, health workforce, health information systems, access to essential medicines, financing and leadership/governance – and argues that, together, these are key to realising more equitable and sustained improvements across health services and health outcomes. Here we focus on four of these - leadership/governance, service delivery, health workforce, and financing – as a potentially useful way to think about what is required and to highlight some key readings for those of you who might want to delve further into this topic. The TWG-FCAS is a working group of Health Systems Global, bringing together researchers, policy-makers, funders and implementers working in fragile and conflict affected states (FCAS), to promote and support the creation, identification and sharing of knowledge, and the translation of this knowledge into policy and practice. The ReBUILD Research Programme Consortium is an international research partnership working towards improved access of the poor to effective health care and reduced health costs burdens, through the production and uptake of high quality, policy-relevant research on health systems in settings affected by conflict and crisis. ReBUILD is funded by UK Aid from the Department for International Development. Governance refers to the set of rules, institutions and relationships by which authority in a given functional zone is exercised to optimise accountability, responsiveness, rule of law and social security. WHO defines the leadership and governance building blocks as "ensuring that strategic policy frameworks exist and are combined with effective oversight, coalition-building, regulation, attention to system design and accountability" ([link]WHO 2010: 86). Leadership and governance, also known as stewardship, form the foundation of the health system by enabling national and sub-national authorities to guide and organise stakeholders in health service provision to maximise the health benefits and improvements. Previous studies show that health systems governance influences health system performance and health outcomes. However, there are few examples of how to implement and monitor good governing practices in fragile and conflict affected environments. Good governance has the potential to make the health system people-centered. More research is needed on implementing a people-centered governance approach in these environments. Decisions taken in the early recovery period after conflicts may affect the development of health systems. Additionally, some suggest that the immediate post-conflict period may allow for the opening of a political ‘window of opportunity’ for reform. For these reasons, it is useful to reflect on the policy space that exists in this period - what shapes it, how are decisions made, and what are their long-term implications? Examining the policy trajectory and its determinants can be helpful to explore the specific features of the post-conflict policy-making environment. Many drivers of intrastate conflict concern the relationship between the state and society, and thus are influenced by the quality of governance. Efforts to restore or create good governance, however, have adopted a relatively standardised democratising template.This article argues that conflict mitigation is a useful mechanism for adapting this template to conditions in fragile states. Human resources for health are self-evidently critical to running a health service and system. There is, however, a wider set of social issues which is more rarely considered. One area which is hinted at in literature, particularly on fragile and conflict-affected states, but rarely examined in detail, is the contribution which health staff may or do play in relation to the wider state-building processes. Health sector recovery in post-conflict settings presents an opportunity for reform: analysis of policy processes can provide useful lessons. The case of southern Sudan is assessed through interviews, a literature review, and by drawing on the experience of former technical advisors to the Ministry of Health. Conflict and fragility are increasing in many areas of the world. This context has been referred to as the ‘new normal’ and affects a billion people. Fragile and conflict-affected states have the worst health indicators and the weakest health systems. This presents a major challenge to achieving universal health coverage. The evidence base for strengthening health systems in these contexts is very weak and hampered by limited research capacity, challenges relating to insecurity and apparent low prioritisation of this area of research by funders. The concept of the essential packages of health services was introduced by the World Bank in 1993 and has been widely used in resource-scarce environments to concentrate resources on cost-effective interventions that meet priority health needs. Over the years we have become increasingly reliant on the Basic Packages of Health Services (BPHS) model for the delivery of health services in fragile and conflict-affected situations. BPHS are frequently delivered through collaborations between the government, UN agencies and international NGOs and are often embedded in a contract. The packages are based on assessments of the country’s needs, existing resources and available funding. As highlighted by Roberts et al (2008) “the aim is to rapidly scale-up health services with proven, affordable health interventions and replace the fragmented, uncoordinated, vertically-dominant services characteristic in many post-conflict settings.” There are a number of useful examples of BPHS implementation. The aim of this paper is to describe the availability of essential health services in rural Liberia five years after the end of the civil war. In 2001, Afghanistan's Ministry of Public Health inherited a devastated health system and some of the worst health statistics in the world. The health system was rebuilt based on the Basic Package of Health Services (BPHS). This paper examines why the BPHS was needed, how it was developed, its content and the changes resulting from the rebuilding.The methods used for assessing change were to review health outcome and health system indicator changes from 2004 to 2011 structured along World Health Organisation's six building blocks of health system strengthening. Health systems in countries emerging from conflict are often characterised by damaged infrastructure, limited human resources, weak stewardship and a proliferation of non-governmental organisations. This can result in the disrupted and fragmented delivery of health services. Photo: A provider at a government-run medical facility in Aden, Yemen, examines Somali refugees that recently fled across the Aden Sea. Thousands of people fleeing civil strife in Somalia have fled safely to Yemen. | Micah Albert, Courtesy of Photoshare. Health workers are arguably the most critical resource in achieving the recovery goals of a health system. But they are often targeted during conflicts and end up seeking livelihoods and security elsewhere. This can result not only in shortages but also lower skill levels among those that remain. After conflict, low numbers of appropriately trained personnel can therefore present a major constraint in re-establishing a public health system. In fragile and conflict affected states, human resource policies and strategies addressing recruitment, remuneration and retention are therefore an essential first step. The role of front-line or close-to-community providers is often overlooked despite the essential role they play in extending services in remote areas. Understanding how health workers have survived, what motivates them, and what coping mechanisms they used in dealing with adversity can also be a key factor in ensuring their re-engagement with the health system. In post-conflict settings, severe disruption to health systems invariably leaves populations at high risk of disease and in greater need of health provision than more stable resource-poor countries. The health workforce is often a direct victim of conflict. Effective human resource management (HRM) strategies and policies are critical to addressing the systemic effects of conflict on the health workforce such as flight of human capital, mismatches between skills and service needs, breakdown of pre-service training, and lack of human resource data. Responding to the global human resource crisis requires systems thinking if a more comprehensive approach to human resource management and development is to be achieved. We present a comprehensive and visible framework for human resource system development. This has been derived from the lessons learned in supporting human resource system development in three fragile and post-conflict health systems in Afghanistan, the Democratic Republic of Congo, and Cambodia. The health financing building block covers a vast range of issues, all integral to the capacity of the health systems to meet demand and supply. A challenge for any health system recovery process is to achieve a system that is "person-centred" and ensure that it is "organized around the person, not the disease or the financing" ([link] WHO 2010 p.3). The ReBuild Research consortium has noted that "health financing policies that support universal access to health care without causing impoverishment are critical for health and economic development in any setting." Linking health equity with social protection instruments, such as fee waivers, targeted cash transfers and subsidies, may boost people’s resilience. Improving financial access to services is an essential part of extending universal health coverage in low resource settings. In Cambodia, high out of pocket spending and low levels of utilisation have impeded the expansion of coverage and improvement in health outcomes. For twenty years a series of health financing policies have focused on mitigating costs to increase access particularly by vulnerable groups. Places affected by fragility and conflict perform consistently worse against a range of development indicators compared to their more stable counterparts. Yet, it is in these contexts that data are most limited, that evidence is of the poorest quality, and that programming and policy making tend to be least informed. The TWG-FCAS has also developed a comprehensive open access collection of resources and organisations on health systems in FCAS.